A litlle more than a year ago, I began working on a book all about mini cakes… elegant little individual sized cakes to make at home. The book was to be called Babycakes. Unfortunately, this publisher was an early victim of the recent cutbacks, and Babycakes future became uncertain. Left with lots of ideas, some great photos, and even better recipies, I just knew I had to share them! 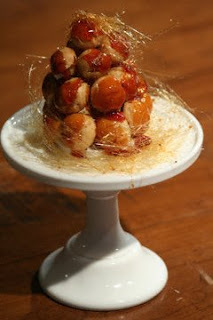 The first one is mini croquembouche, which is traditionally a French wedding cake. Lovely little cream puffs, filled with pastry cream or chocolate ganache are dipped in a beautiful clear caramel, and glued together while the caramel is still warm and sticky. The same caramel is used to make the glistening spun sugar that embraces the little tower. How dramatic it would be to present each guest at your next dinner party with their own glittery croquembouche! One tower is more than enough to serve two guests. Start here with the recipie I’ve posted previously for chocolate eclairs. Instead of piping out strips, pipe out small rounds, about one half inch in diameter. When baked and cooled, fill them with the pastry cream, flavored as you like. -Place the sugar in a medium sauce pan and pour the water around the edges of the pan. -Put the pot over high heat with the lid on. This will keep the steam trapped inside throught the beginning of the cooking process and let it drip down the sides and wash off any sugar crystals that may form. Keep the pot covered until the sugar has been boiling for about 5 minutes. Do not stir cooking sugar. -When the sugar begins to take on an amber color, you may swirl the pot to keep the sugar cooking evenly. Cook until sugar has taken on a rich amber hue, careful not to overcook and burn the sugar or it will be bitter. - Cut a 3” circle out of cardboard. Cover circle with parchment paper and glue it down with a small dab of the caramel. -Carefully dip the top of each filled cream puff in the warm caramel and place it, with the caramel facing out around the outside of the parchment circle. Continue like this until you have one complete circle. Each subsequent row should start between two of the puffs on the previous layer. Keep builidng up until one puff tops the tower. If carmel starts to stiffen up too much, you can put it over a gentle heat to remelt it, being careful not to cook it further. -To make the spun sugar, secure a wooden spoon to a counter top with the handle hanging off the edge of the counter. Masking tape is a good way to do this. Its also a good idea to put a couple of pieces of parchment or papertowels on the floor, as this can get a bit messy. -Warm the sugar so its fluid. Dip a fork in the fluid caramel and swing it with a brisk movement over the top of the wooden spoon’s handle. Thin threads of sugar should form over the handle. Gather up these threads and wrap them around the base of your tower to create a bed for it, or wrap them around the tower as in the photograph. 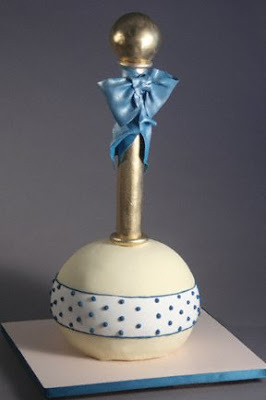 On Facebook, someone asked if this cake could deliver itself... if only it could! 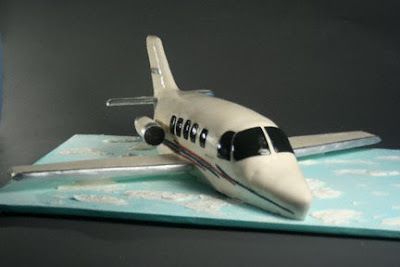 Not quite sure that decadent chocolate cake and rich ganache are aerodynamic, but then I've never really understood how those massive steel bodies stay up there anyway! That brings me to one of the things I love most about cake... each new project is an opportunity to look at thing we take for granted in an entirely new way. The beauty of this plane is that its wing span is almost the length of the the entire body. 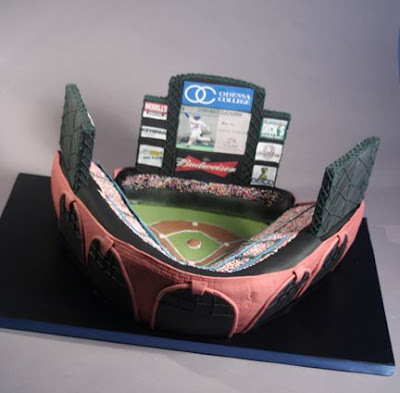 Its difficult to create the lines in curves in cake, and someone did it out of metal! With projects like this, I really learn to appreciate the talent of those that create and design the things we love and rely on every day!